Casa del Virrey Eslava 108, se encuentra a pocos pasos de la mansión de García Márquez, el Hotel Santa Clara y los mejores restaurantes de la ciudad vieja de Cartagena de Indias. Casa del Virrey Eslava es el más lujoso complejo multifamiliar de su tipo. La propiedad surge de la restauración de la vieja escuela, La Esperanza, construido y parcialmente restaurado en 2008 por Alberto Samudio, quien le dio un ambiente moderno, con su estilo muy particular sofisticado. Esta residencia de estilo casa se divide en cuatro niveles. Cuenta con una piscina en la primera planta, 3 dormitorios en el segundo nivel, 1 suite en la tercera planta con una terraza y un jacuzzi. El cuarto nivel tiene un solarium increíble para admirar la vista de la ciudad, ir a tomar el sol o disfrutar de una hermosa noche de luna llena. Además de los servicios internos de la casa, Casa Del Virrey Eslava ofrece piscinas 2 vueltas, gimnasio, spa, sauna, salas de masajes y la seguridad de conserjería las 24 horas. La Casa del Virrey Eslava 108, se encuentra a pocos pasos de la mansión de García Márquez, el Hotel Santa Clara y los mejores restaurantes de la vieja Cartagena. Casa del Virrey Eslava es el más lujoso complejo multifamiliar de su tipo. Esta propiedad emergió de la restauración del antiguo Colegio de La Esperanza, construido y parcialmente restaurado en 2008 por Alberto Samudio quien le dio un ambiente muy moderno con especial estilo sofisticado. Esta residencia de estilo casa se divide en cuatro niveles. Cuenta con una piscina en la primera planta, 3 dormitorios en el segundo nivel, 1 suite en el 3er nivel con terraza y jacuzzi. En el cuarto nivel tiene un solarium increíble para admirar la vista de la ciudad, ir a tomar el sol o disfrutar de una hermosa noche de luna. El alquiler incluye: - Internet de alta velocidad. - limpieza - Compras en el supermercado. - El personal incluye 1 ama de casa a tiempo completo - TV internacional - Propinas no incluidas. - Comida no incluida. - Planchado no incluido. We stayed with a group of 8 adults and the house was more than adequate for us all. The house was impecable in terms of cleanliness and organization. However; the best part were our housekeepers and cooks. Every single meal was better than the last; we asked for specific things like avocados in every meal and fried fish for lunch, but otherwise allowed them to choose the menu according to the traditional foods of the region and and we were beyond impressed. This will be a place we will recommend to anyone and will hopefully visit again. Great find; you don’t need to look elsewhere. It is far enough from the hustle and bustle of Cartagena; but close enough to walk everywhere. Highly recommend this house for a group. Excellent stay in old town! The villa was very well located. Walking distance to everything in old town and Getsemani. The villa itself was wonderful. We were two families and there was enough room for all of us to be together or separate as needed. The house was well furnished and stocked. The pool in the back of the house, the hot tub on the roof terrace and the larger pool in the complex gave us and the kids plenty of options to cool off in the mid-day heat. We elected to have the chef services and Rosa (our chef) made the most delicious food. We only wished she could cook for us for the rest of our lives! We visited Cartagena and stayed in this beautiful house with our five children ages 13-22 over Christmas Break. The house is in a perfect location in the Walled City, close to all the sites and walking distance of excellent restaurants and shops. Katia and Rosa made absolutely delicious breakfasts for us every day, kept the house nice and clean and even made us dinner for New Year's Eve! The housekeepers were lovely and so was the house! Highly recommend Cartagena - a wonderful city and the weather at this time of year was just perfect coming from the northeast of the US. Sunny and warm every single day! My husband and I traveled to Cartagena from CT with my three grown children and my son-on-law. Each party had their own bedroom -- two are on the second floor and one is on the third -- which allowed for privacy when needed. We gathered around the dining table for big, beautiful breakfasts prepared by Rosa. She and the housekeeper, Katia, were very accommodating, and even though our Spanish was spotty, we were able to communicate. The house was kept clean and Katia did laundry for us a couple of times. We spent a lot of time on the third floor patio, enjoying the birds, sunsets, and naps. My only suggestion is to check the leaking refrigerator and the downstairs fan. We couldn't get the first floor quite cool enough, even with the portable floor fan, and it was rather noisy. I would highly recommend this house. Cartagena is a lively, bustling city, and the condo complex was quiet and relaxing. The pools were terrific! Thank you for your review, we also enjoyed hosting you and your group. 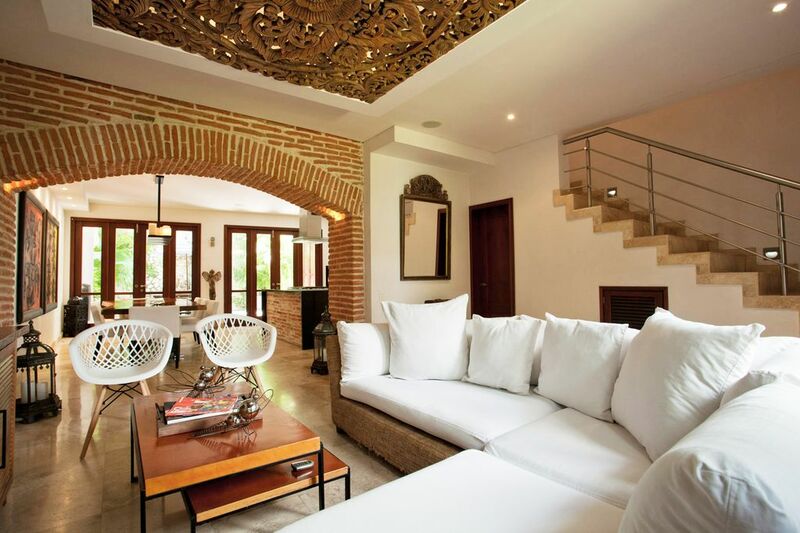 Thank you for choosing my property for your vacation in Cartagena. Unfortunately, the refrigerator was in its final days and was replaced for a new one right after you departed. We placed a fan to help defrost the dying refrigerator. Very. Safe as quiet as it can be in the walled city during Christmas season. House help was great! Elegant, comfortable for 6 Great staff and great food. Extra room on top was a bit tight for a couple. More counter space and an extra luggage rack would have been helpful. Located very well in a tranquil part of town! This is a very nice place to stay. I was here with a small group for a milestone birthday and found it to be a beautiful and quiet respite from the noise of the city. Also, it is in a secure community with a staffed desk at the front door. Ivan was super responsive--we had an issue with the hot water heater and he took care of it quickly--it is reassuring to know that not only a place run smoothly, but when there are inevitable hiccups, they are handled well. We had chosen to have breakfast and housekeeping taken care of by Rosa and found her wonderful--both what she prepared and how she took care of the place. Totally recommend her as well. Overall Cartegena is a great place to visit (this my first) and this property is a great place to stay in a great city to visit.